DC indie-poppers Bellman Barker are back with a couple of new studio tracks on their myspace page (“Top of the Stairs” & “Two Bees”) and a big show at the Black Cat in DC. Good enough for you? 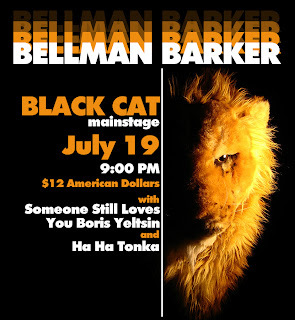 They’ll be rocking out this Saturday the 19th with Someone Still Loves You Boris Yeltsin and Ha Ha Tonka. Go and give them a hug. bellman barker was great last night. aaron has an incredible voice and the drummer is unreal. their set got cancelled at fort reno in late june due to rain. that day they were on the same bill as the moderate, a local alt-country trio. caught THOSE guys in baltimore on friday night at lo-fi and they are SICK. playing at iota this tuesday (7-22) with brandon butler.